A rare facsimile of arguably one of the most important documents in English history, the Magna Carta, will be going on display on board Cunard’s flagship liner, Queen Mary 2 and sister ship Queen Victoria between May and September 2015, as the ‘Great Charter’ sealed by King John in 1215 celebrates its 800th anniversary year. 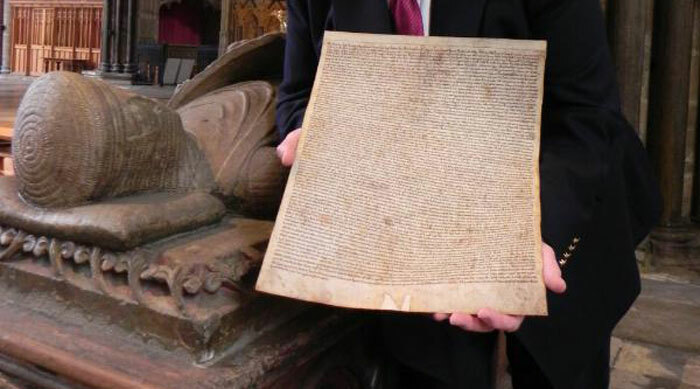 As the shipping line continues to celebrate its 175th anniversary year, Salisbury Cathedral will be lending a rare facsimile of its Magna Carta, one of only four of the original 1215 documents in existence, to Cunard. The facsimile will be displayed in the Grand Lobby of Queen Mary 2 from early May until September 2015, with a 6 night sojourn aboard Queen Victoria in late May. Robert Key, Chairman of the Salisbury Cathedral 2015 Magna Carta 800th Anniversary Board, and a Member of the National Magna Carta 800th Committee will be escorting the copy of Salisbury’s Magna Carta during crossings aboard Queen Mary 2 on 10-17 May 2015 and 4-11 September 2015, and aboard Queen Victoria’scruise on 22-28 May 2015. Robert will hold two talks on each voyage about the legacy of the Magna Carta, and the profound effect it had in shaping the world as we know it today. The Magna Carta was a series of written promises between the king and his subjects that he, the king, would govern England and deal with its people according to the customs of feudal law. The Magna Carta was an attempt by the barons to stop a king – in this case John – abusing his power and causing suffering to the people of England.